The Liberty Grand Entertainment Complex is a fantastic wedding venue as it stands. With three distinct reception rooms surrounding a courtyard where ceremonies and cocktail hours are held this large and spacious venue can hold 400+ guests and it offers a comfortable ceremony site as the building stops the wind from coming through making it enjoyable for three seasons of the year. However once the sun sets and the moon rises the building is transformed by the exterior lighting accenting the sculptures surrounding the exterior. The feeling of walking up the red carpet towards the grand doors is wonderful and in this night time wedding photo at a Sri Lankan event the bride and groom are back lit by a flash against the red carpet, the golden doors, and the blue sides of the building giving a wonderful contrast in the colours. 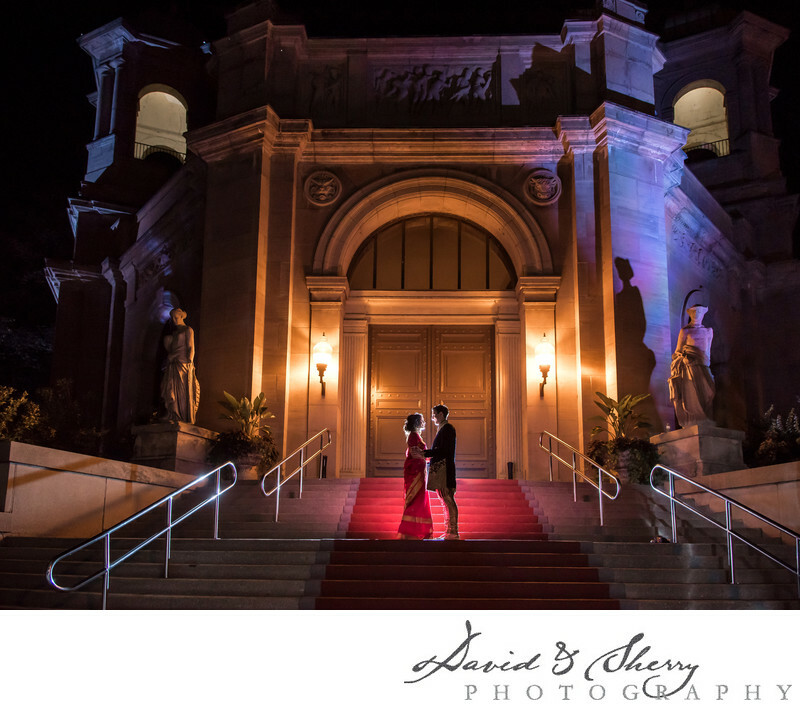 We ask our couples to stand facing each other and we place our remote controlled flashes behind or wherever is needed to light the image the way we see it. In the editing of this picture we had to remove a bit of glare from the light reflecting off the railings.